My Creative Flavors: Life is Good with Coconuts, Ice creams or Shall I say Both ! Life is Good with Coconuts, Ice creams or Shall I say Both ! Good Morning Folks, I have a question? Do you all crave to "Eat Something - sometimes or most of the times" ? I do and would rate myself quite high on scale of 1 to 10, very often. At the same time not sure exactly what I am are looking for ?... Then I close my eyes and wish for a fairy with a magical wand to come and fill my table with the aromatic and refreshing dishes. The dish list is contingent upon the level of activity in my amygdala, sometimes feeling romantic and at times nostalgic, at times oozing out with energy and at times down with lethargy. I always wonder how these highs and lows of emotions nestle quietly in my mind. Then after a while get a straight call from the amygdala craving for a 'typical food'. I think, its time for me to stop contemplating about my hunger waves to be in congruence or not to my mood waves and enjoy the last weave of spring. And at bottom of my heart I always want to keep the sprig of spring with me - be it summer or fall as I do get enchanted with the fresh flair of flowers, giving us ample reasons to lighten up the mood and relive our life ! Taking a break from life is good. It rejuvenates the mind and soul. Last week I took a break and went on a small vacation with family. We were thrilled to see the fresh coconut trees lined up across the streets and fresh fruits hanging like jewels on the top. the fresh coconut water served in the green shells makes it for the best summer drink. At that very moment I got the 'Aha' moment. Got the answer for a new thrilling recipe to share with 'All of You'. This week I'm gonna share a recipe based on Coconut. Can you guess WHAT ?????? Initially got to make fresh coconut salsa to enjoy with idlis or Thai curry. But as the temperature touched to 80s, I was craving to have a soothing homemade dessert. After flipping through my old and new cookbooks, finally zeroed in to make a sizzling 'Coconut Ice cream'. The nutty icecream seems to be so light, fluffy, creamy, chewy yet appetizing. Fresh Home made Coconut Ice Cream ! I got satiation only after eating the whole cup of ice cream :) , Not too bad - after all I deserve my cup after a little hard work that I did. So lets lets check out this recipe ! The only difficult thing in this recipe to do is peel the coconut, with a little skill and caution and take out the coconut pieces. Wash and dry the shell to serve the ice cream or dry nuts, later. Finely shred or chop the fresh coconut with the help of grinder. In a bowl, open the cans of coconut milk and add splenda (or sugar to taste). Whisk the coconut milk and sugar. Add a pinch of salt and just few drops of vanilla essence. Now, its time to add the freshly chopped coconut to our mix & blend it in a blender for 3-4 mins on high speed. Once done, pour all the ingredients in the ice cream maker and churn it for 20-25 minutes (or according to the manufacturers instructions). On completion. transfer ice cream into an airtight container and chill it for about half an hour for it to firm up. The wait is over and ice cream is ready to be licked and loved.......!!!!!!!! Scoop it out and serve in coconut shell, topped with fresh mint leaves. Mmmmm... Fresh & Chewy ! I am so glad to see the bowl of my first successful attempt at making coconut ice cream this summer. And so determined to make it more often. Learning and cooking new recipes is an amazing way to turn an ordinary weekend to a memorable weekend with your 'loved ones'. After all, it was so simple and too delish to relish on the special weekends !!!!!!!!! Stay tuned for my special Fathers Day Recipe, coming soon ! Wat a stunning and droolworthy icecream..
Just fabulous! I've pinned this to my ice cream board so I never forget that one day I will give it a try! What a superb click and lovely recipe too.. I have tried coconut ice cream from a Thai restaurant and loved it! Urs look lovely and creamy! Oh Yummm!! !This looks wonderful.What an innovative way to present ice cream in coconut shell.Its an unique & perfect summer treat.Your clicks are fantastic !!! What a gorgeous ice cream. I adore coconut ice cream. Love your presentation as well. Wow..absolutely stunning...loved your presentation in coconut shell. And I am a big fan of everything coco-nutty, so a big thumbs up for this superb recipe. This sounds great, is the splenda just to lessen calories or are you diabetic? oh both for sure! Wow- my mouth is watering. I can just taste the refreshing sweet exhilarating flavor of the cold coconut flavor! YUM! Fresh coconut! I'm envious! 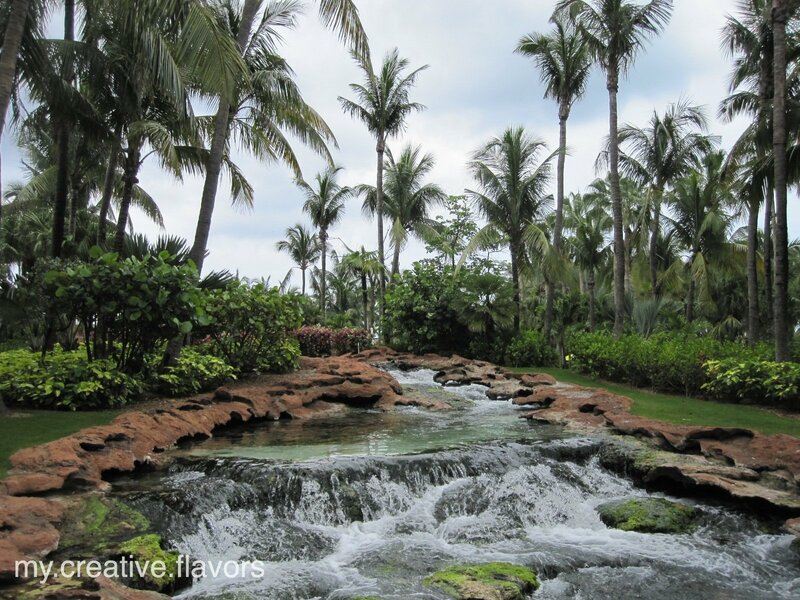 What a fantastic ice cream and lovely pics both of the ice cream and that lovely stream lined with coconut trees! Gorgeous! Thanks Divya. I appreciate that ! I love the presentation it is beautiful! Coconut is one of my very favorite foods. This ice cream looks beautiful, refreshing, and delicious! So pretty! I love love love coconut! Pretty much all of my ice cream recipes call for coconut cream. I find it adds plenty of sweetness without so many of the calories. Fresh coconut ice cream! Omg, this looks so good. I love that you put it in the coconut! Very cute!